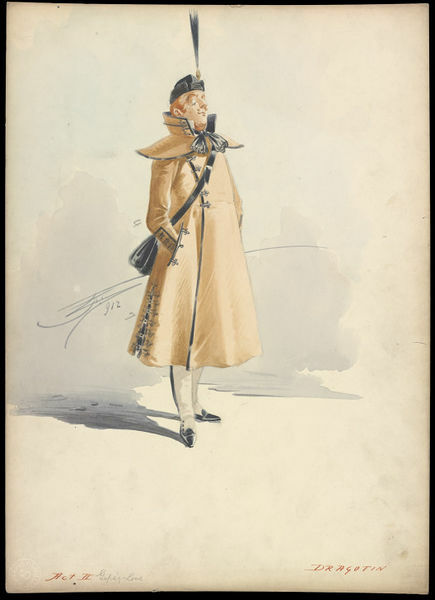 Costume design by Attilio Comelli for Dragotin in Act II of Gipsy Love at Daly's Theatre, 1912. Dragotin was played by W.H. Berry in this production. The Gipsy Girl, or Zigeunerliebe in the original German, is an operetta by Franz Lehár. The English lyrics for this production at Daly's Theatre, London were written by Basil Hood and Adrian Ross. The story follows Ilona who is engaged to Jonel. After meeting Jozsi, a gipsy violinist, Ilona doubts her feelings towards Jonel and wonders if she would be happier with Jozsi. Ilona dreams of a life with Jozsi but realises she would not be happy. On awakening she devotes herself to Jonel. Zigeunerliebe premiered at the Carltheatre in Vienna in 1910. 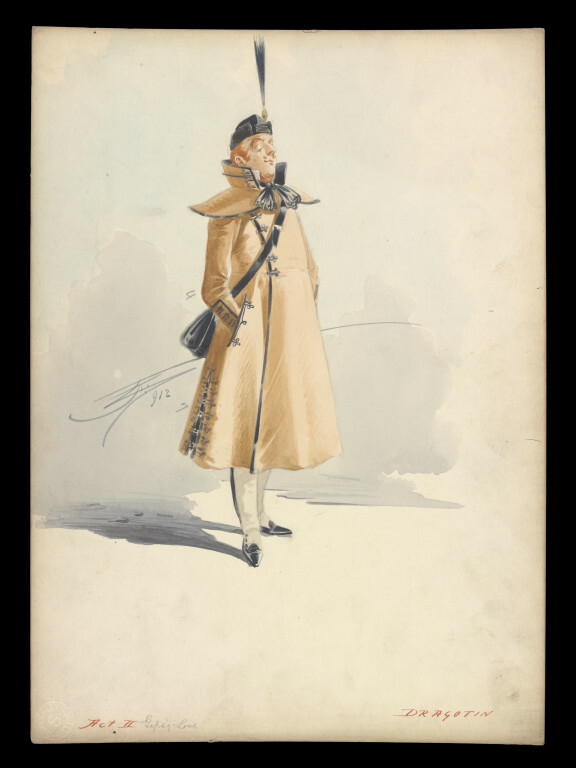 The production that these costume designs are from opened at Daly's Theatre on 1st June 1912. 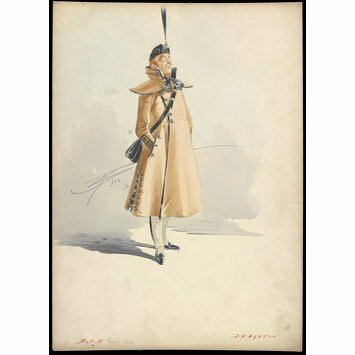 Costume design for Dragotin in Gipsy Love at Daly's Theatre. Male figure in a light brown coat with black details, a black hat with long black plummage sticking up at the front, and a black bag. Signed. Rough sketches on reverse. Costume design by Attilio Comelli for Dragotin in Gipsy Love at Daly's Theatre, 1912. Emile Littler Archive.